The Gray Iron Fitness Newsletter, Issue #165 The Terminator is back! There are some larger than life people whose first names are all that’s needed and you know who they’re talking about. If someone says “The Donald,” (love him or hate him) you know it's Trump. And if you’ve ever picked up a barbell of any weight at all, and someone refers to "Arnold," you know exactly who they're talking about. “I’ll be back!” said Arnold The Terminator, in 1984. Remember? Now the fourth chapter of The Terminator movie series opens today, July 1. At 67 years old, you have to wonder how Schwarzenegger pulls off this one? I’m not an expert. I know about this only because the weekend edition of The Wall Street Journal runs a movies and book review section and an interview with Schwarzenegger was in it. Otherwise, I’m pretty much a dunce when it comes to Terminator knowledge. The first one was great fun, I thought, but sequels didn’t tempt me. Nonetheless, I think his WSJ interview was a good one. I guess we’ve forgotten, forgiven, gotten-over, or whatever, Arnold’s “shortcomings.” The questioner asked no specifics about previous personal transgressions such as steroid use, marital problems or other negatives. He did, however, touch on some fitness items. He says he carried this habit over to his education, the kind of books he would read, and whatever he expected to accomplish in life. Even as Governor of California he wrote down goals he wanted to reach, but noted: "In politics you’re happy when you at least accomplish more than half your goals." 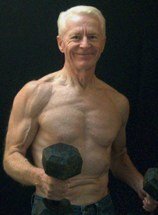 For fitness seniors, here comes the juicy part. Notice how he has tempered his training to make it more age-appropriate. Like Arnold, at some point all seniors are wise to concern themselves less with how much they bench-press (or maximum efforts on other lifts), and focus on all around fitness. If even Mr. Olympia must accept the laws of nature, we regular folks should too. Depending on the distance of his bike ride to and from the Gold’s Gym, his workout format seems sensible to me. Senior beginners especially must be careful about doing too much too soon. A good place for them to start is right here. At all stages, training should be balanced and regular, but not all consuming. There is more to life than that.